This week’s Pic of the Week takes us back to Germany and to the state of Saxony. This time, however, we are going to the Vogtland region and to this city, Plauen. With 66,200 inhabitants, the city is the capital of the Vogtland district and is the second largest city along the White Elster River, The city is the sixth largest in the state behind Zwickau, Chemnitz, Görlitz, Leipzig and Dresden. 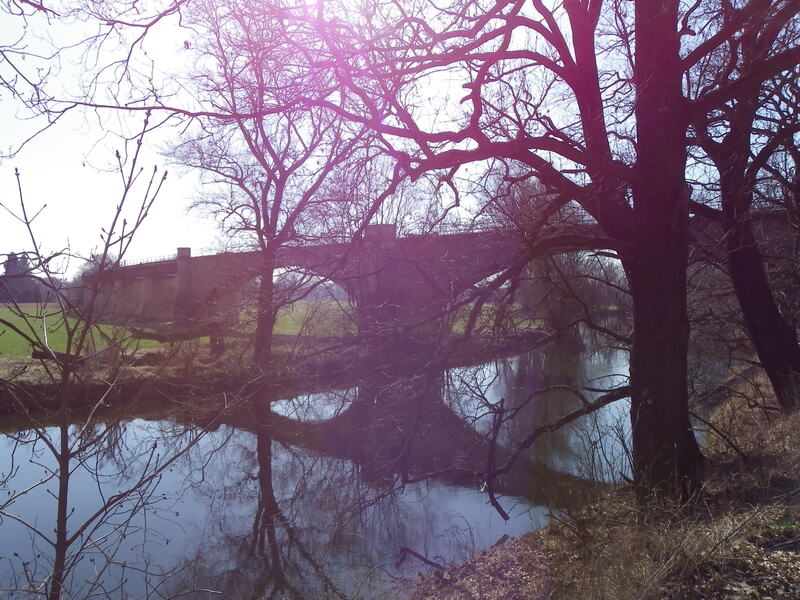 And this historic arch bridge is one of the oldest in Saxony. It was built in 1636 and had served traffic connecting its city center with the southern suburbs before it was decommissioned in favor of a concrete bridge, built 40 meters to the west, in 2001. The bridge has since been repurposed as a pedestrian and bike crossing and even has a beach pub on the northern bank of the river. This shot was taken at sundown in May 2018 and features the bridge, the city’s skyline featuring the cathedral and the tower of the city hall, and a colorful background that makes this sunset shot a “once in a lifetime” one, even after making some artwork out of it with Instagram. 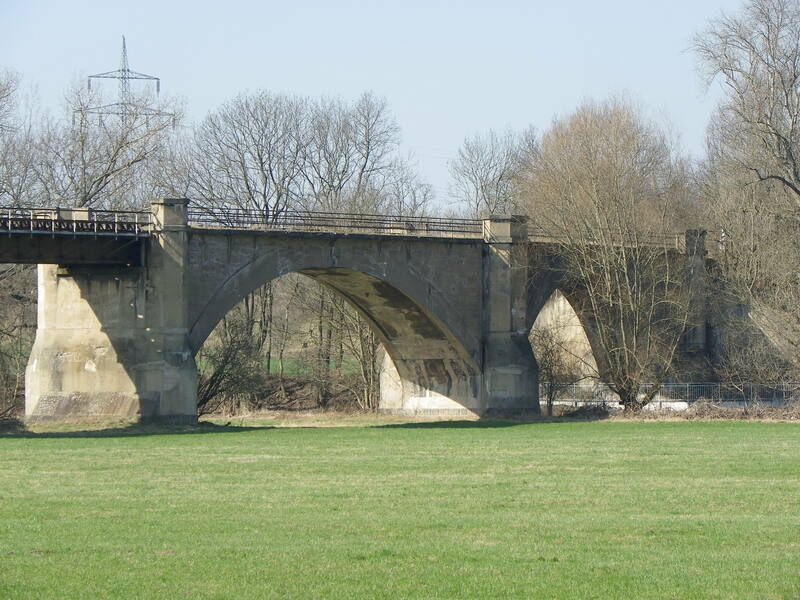 As far as the other bridges in Plauen are concerned, there are at least two dozen structures in the city as well as within a radius of 10 kilometers. They include those in the outlying areas, such as Jocketa, Oessnitz, Weichlitz and even Pirk, some of them being viaducts carrying either the Nuremberg-Hof-Chemnitz-Dresden Railline or the Motorway A 72 which originally connected Chemnitz with Hof but has now included an Extension to Leipzig-Süd. The author is in the process of touring the area and will have a tour guide ready by the end of this year. In the meantime, sit back and enjoy the scenery this Bridge and the city’s guideline presents you. 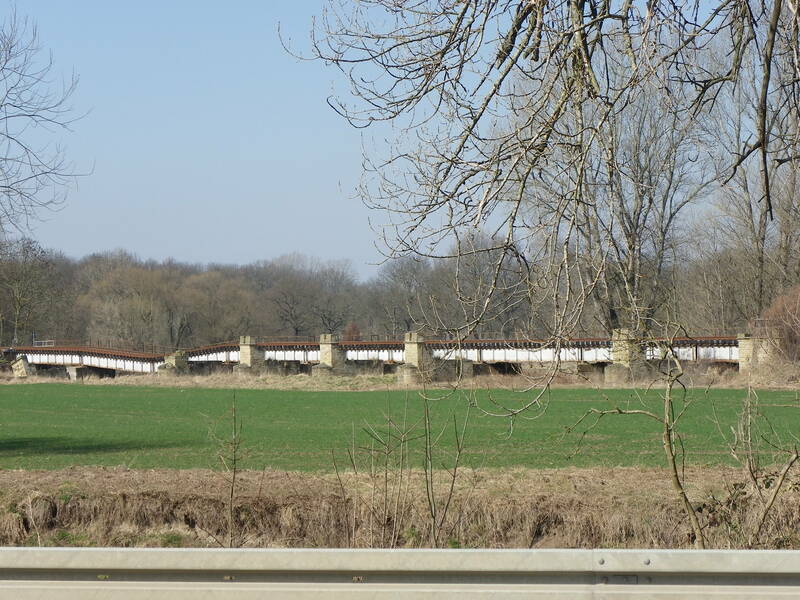 During a recent bike tour along the White Elster from Gera to Leipzig (all 90 kilometers of it), I came across this unique structure. 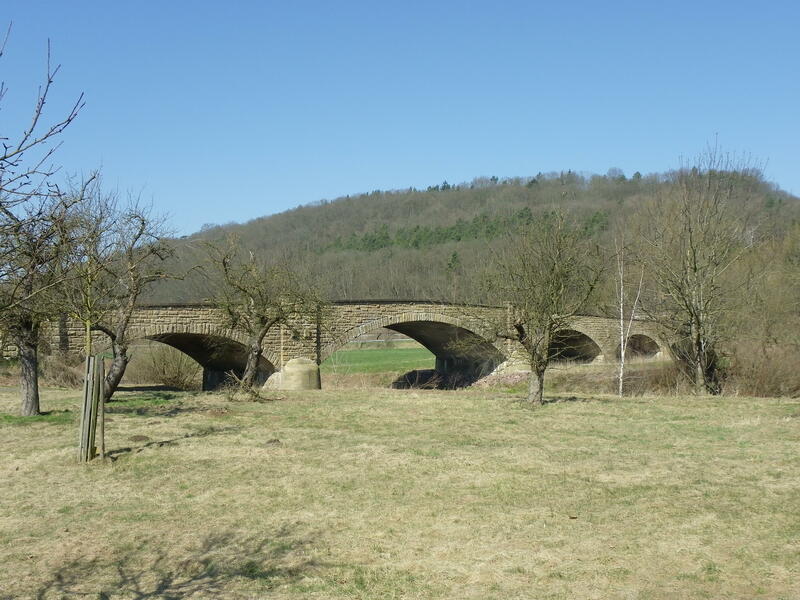 After passing through Zeitz and having revisited some of its historic bridges (see link), one would expect to see more of these historic bridges along the river, especially as Saxony-Anhalt has a wide selection of historic bridges worth visiting. 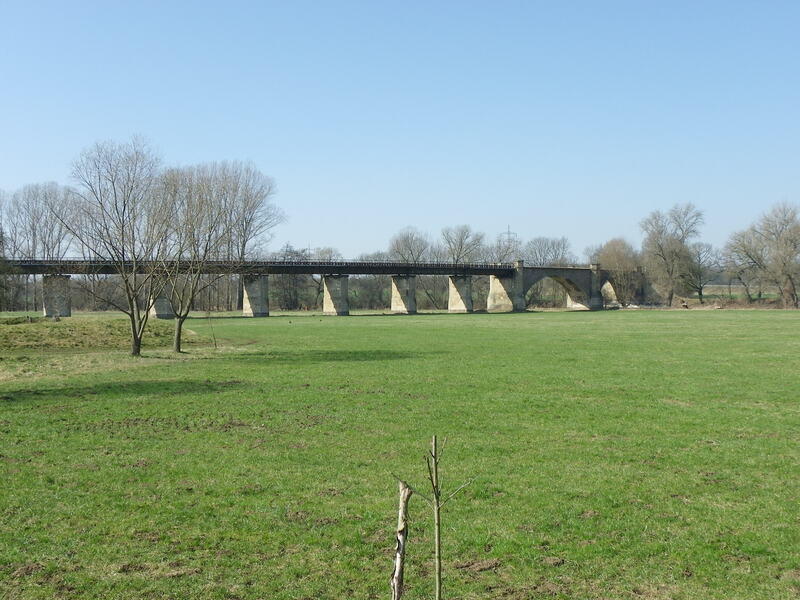 One needs to see the towns of Halle (Saale), Magdeburg, Quedlinburg or even the bridges in the Saale-Unstrut River corridor in order to gather the impression that the bridges are being cared for by the state; this includes using funding provided by the European Union but also by the federal government to restore them to their original form while ensuring that cars and bikes can use the bridge. 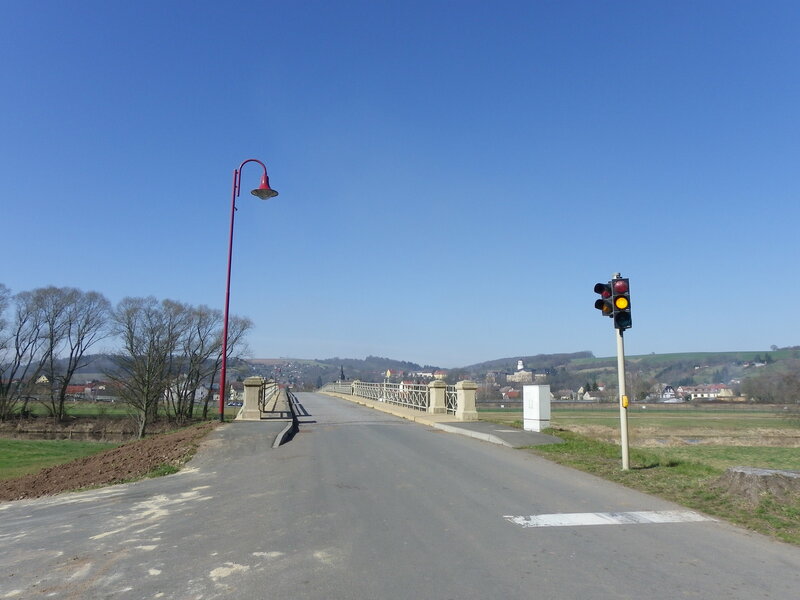 The Draschwitz Bridge is one of these structures that received this kind of care, as it was restored in 1999/2000, which included new wood decking plus paint on the superstructure, as well as work on the foundations. 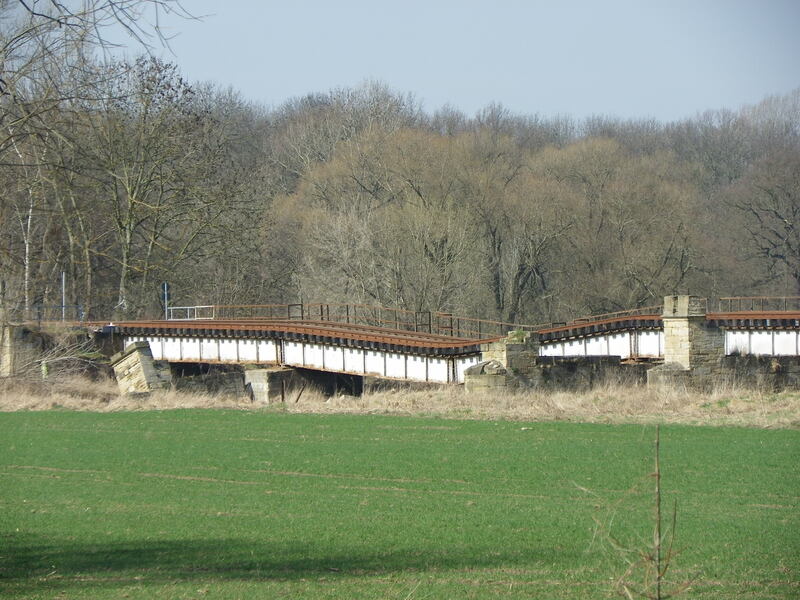 Given its location on a less used road that is occupied mainly by cyclists and locals driving their cars across, the restoration was worth it, as the bridge serves a local road and the White Elster bike trail, which connects Hof (Bavaria) and Halle (Saale), running parallel to the river until its confluence with the Saale River, between Halle and Leipzig. 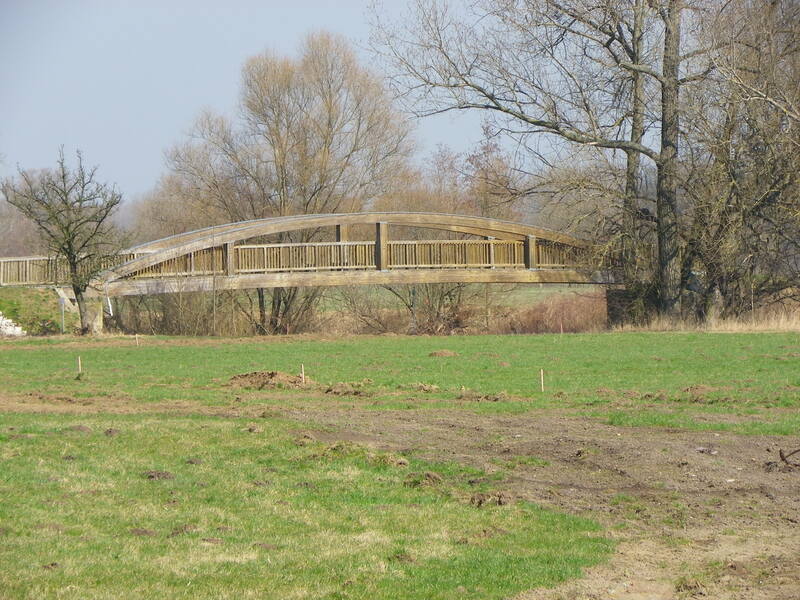 But what makes this bridge unique is its unusual truss design. The bridge was built using welded connections instead of pinned connections, as seen on truss bridges in general. 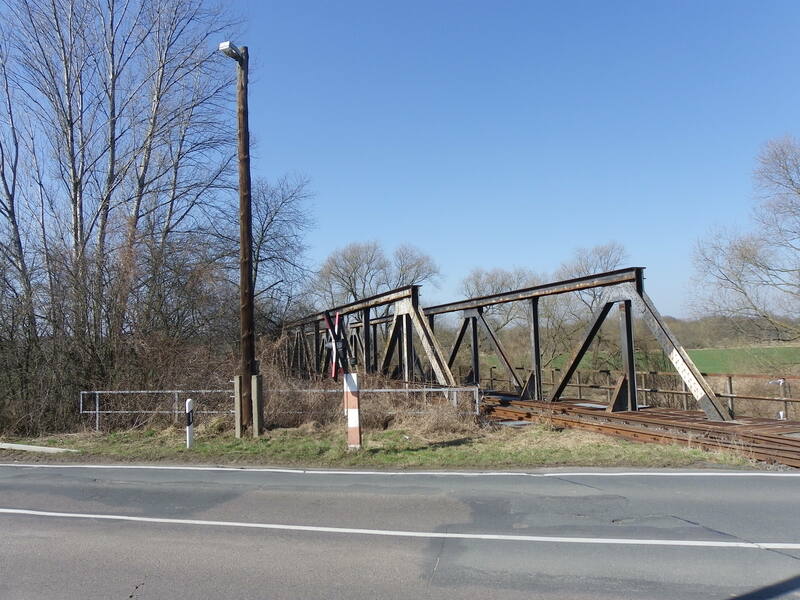 Welded truss bridges, together with those with riveted connections were starting to come onto the scene at the time of its construction, as vehicular traffic- namely trains, but also later cars and trucks- had increased since the expansion of the railroad. This prompted the introduction of a network of roads connecting towns on the local level, but later expanded to cities on the regional and in the end national levels. 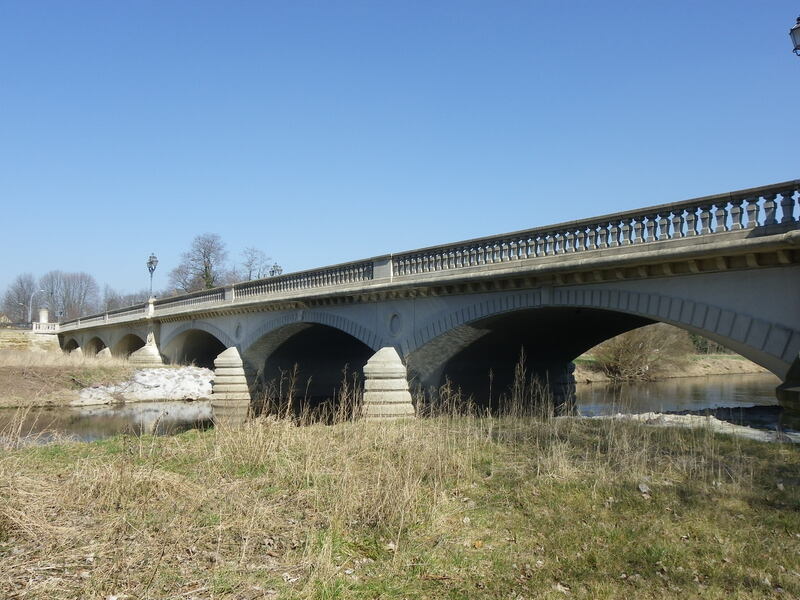 While pinned-connected truss bridges were able to handle light traffic on local roads, as traffic increased and highway systems were introduced, they were replaced with truss bridges with riveted connections. 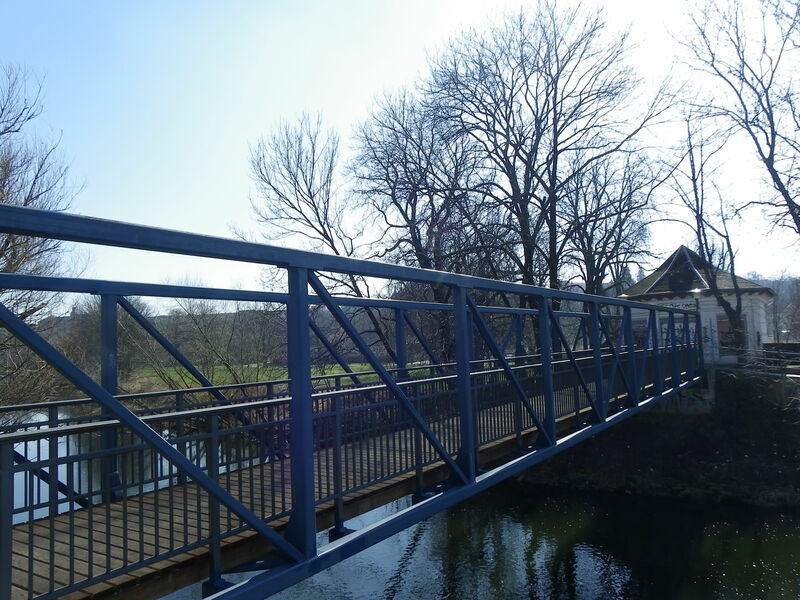 Welded truss bridges were introduced in the 1890s to replace the pinned-connected bridges for despite its biggest asset of dismantling and reassembling the bridge at a different location, missing or broken bolts and cracked eye-bars made it difficult to impossible to relocate the bridge. 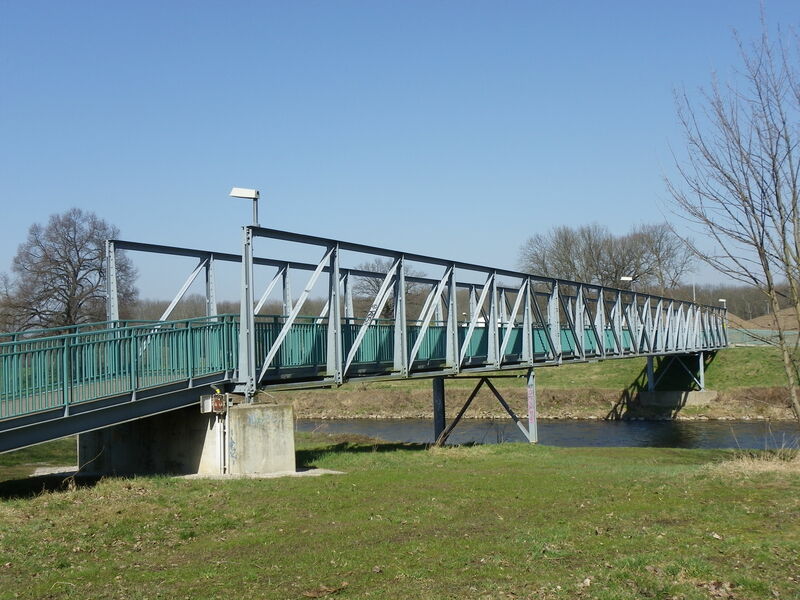 With welded truss bridges, one has the advantage of relocating the bridge without having to take it apart. Plus with the beams fixed together and welded with bolts, there is more resistance to weight that is on the bridge. 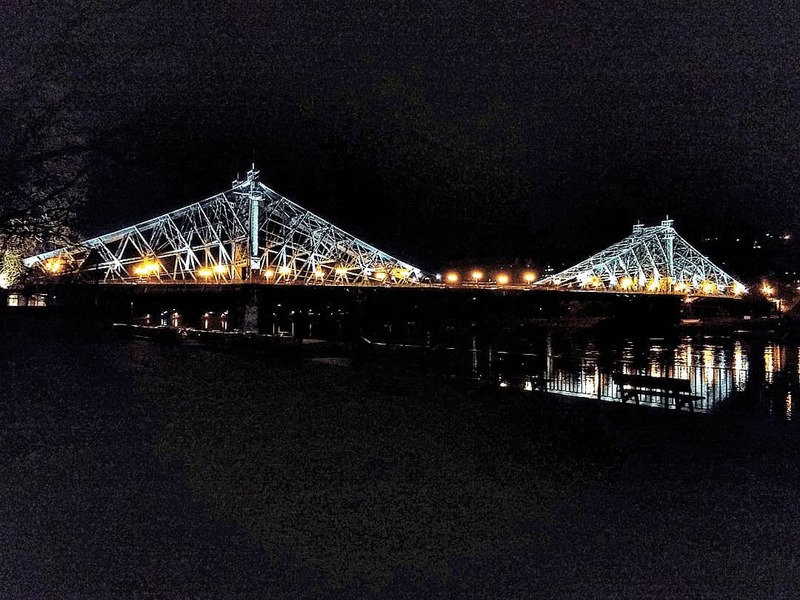 The Draschwitz Bridge has this on not only the trusses themselves, but also the outriggers that support the two center panels- an anomaly given the fact that truss bridges usually have outriggers on every vertical beam and panel, especially those in the US built after 1900. Another unusual feature is the upper chord itself. Normal truss bridges have upper chords that are of either squared shaped beams, V or X-laced or those whose shape resembles the letters I, L and C. They are supported by vertical and diagonal beams that are up to half its size and width. For this bridge, the upper chord and the vertical and diagonal beams are of nearly the same size. However, even more unique is the angled bracings that weave along the top chord, the points sticking outwards by up to 10 centimeters. 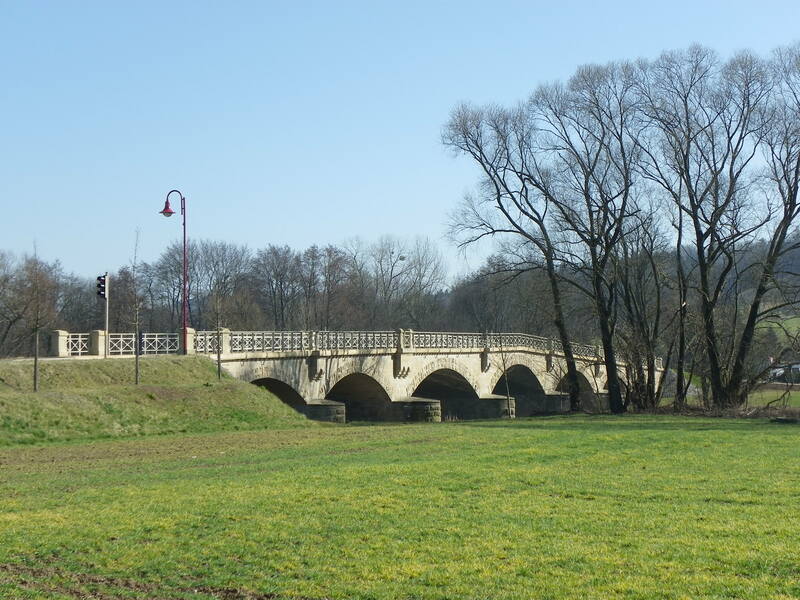 While some truss bridges in the US and Germany built prior to 1885 may have had features like this bridge, the Draschwitz Bridge is the only known bridge to have an upper chord, decorated with such unusual bracing. 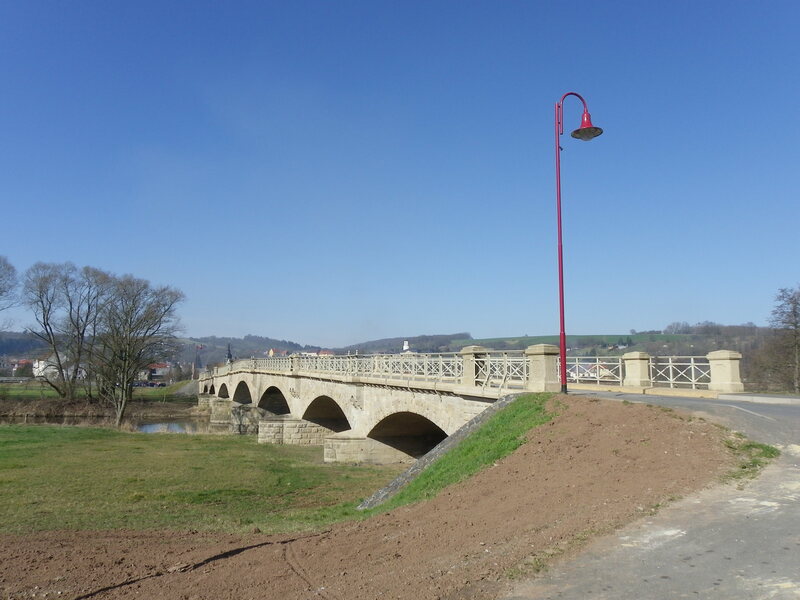 Apart from the renovations, nothing has altered the bridge, even when villagers installed a plaque on the western wingwall, indicating the high water mark set by the flooding in 1954. Chances are, the White Elster may have been rechanneled after that, raising the bridge to prevent it from being swept down stream. Yet, a curved beam connecting that wingwall and the pier raised some eye brows as we don’t know what this serves, except to support the bridge in one way or another. The Draschwitz Bridge is really a gem in the field when it comes to finding historic bridges. The structure continues to serve local traffic and the Elster bike trail to this day. It’s one of the landmarks one should see when passing through Zeitz and the Elsterau, also the last one to see as one bikes north toward Leipzig, but one that the quiet village of Draschwitz should take pride in, one that Saxony-Anhalt has taken great care of, just like the state’s other historic bridges, and one that historians, pontists, engineers should study further to find out more on its history and structural features. It’s the one bridge that a person can spend lots of hours with the camera and a picnic blanket, sitting and indulging at its beauty, surrounded by a historic and natural landscape. 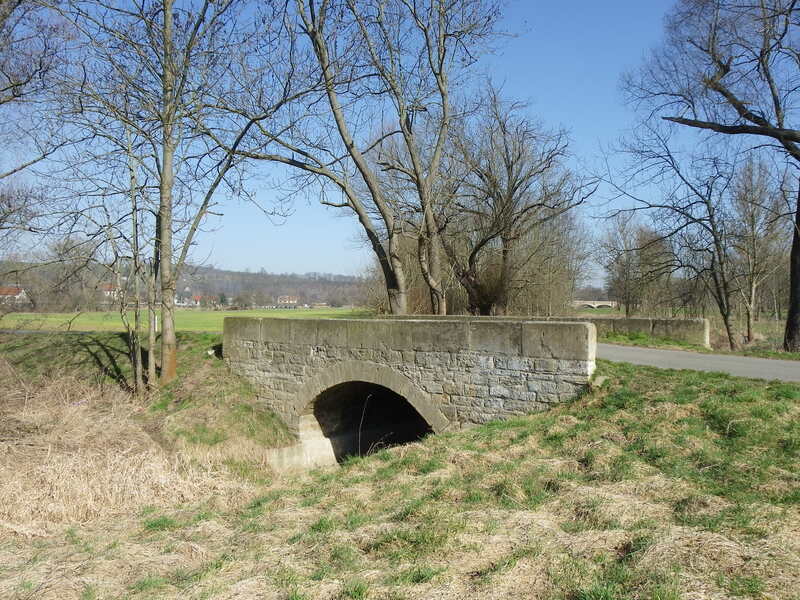 If you know more about this bridge, feel free to post your comment in the Chronicles’ facebook page or contact Jason Smith using the contact information in the About page. 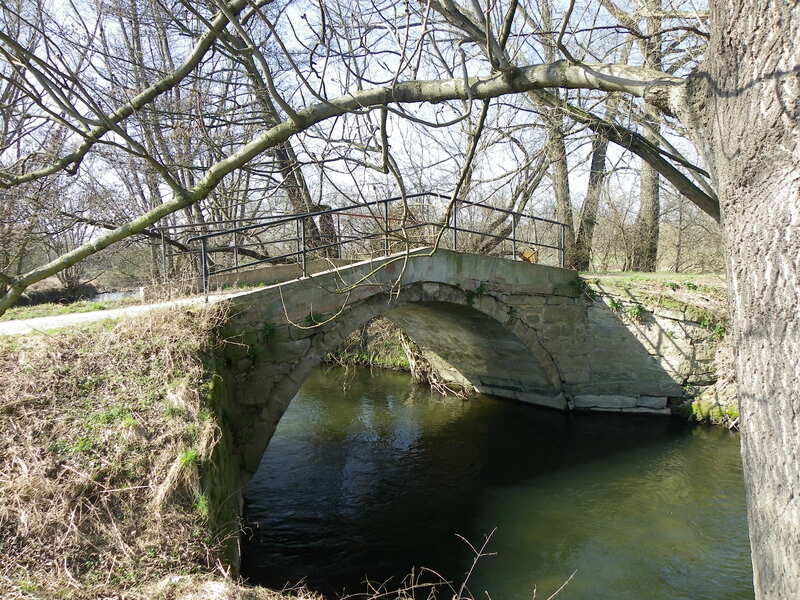 Author’s Note: This Mystery Bridge is part of the bridgehunting tour through the small town of Zeitz, located along the River White Elster in the eastern part of the German state of Saxony-Anhalt. A tour guide of the town that has “Rather stood still in time” will follow here in the Chronicles. 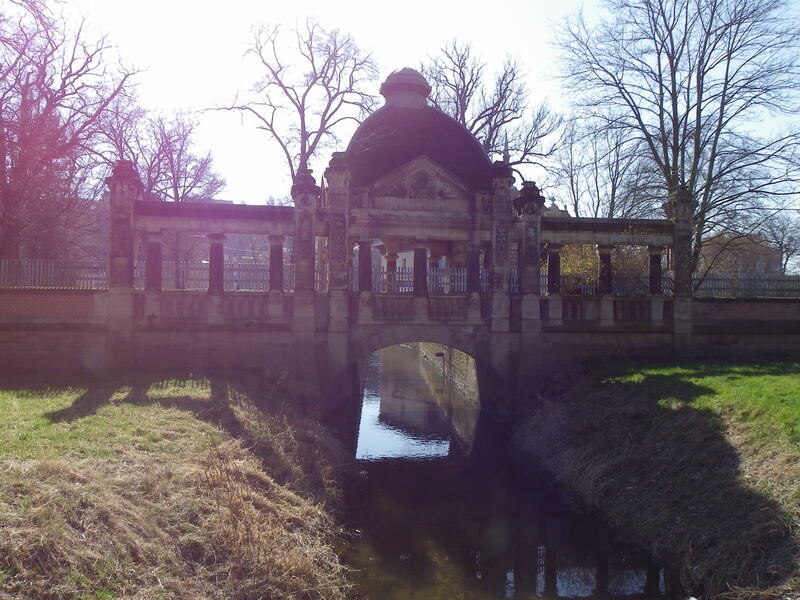 Our next mystery bridge takes us back to Germany and specifically, to Saxony-Anhalt. Despite being the most sparsely populated state in the Bundesrepublik based on population versus land size ratio, the state is an attraction as far as nature, historic buildings (many of them sitting abandoned since 1990) and historic bridges are concerned (especially if we look at the bridges in Halle (Saale), Magdeburg and Quedlinburg). Zeitz is no exception to the rule. 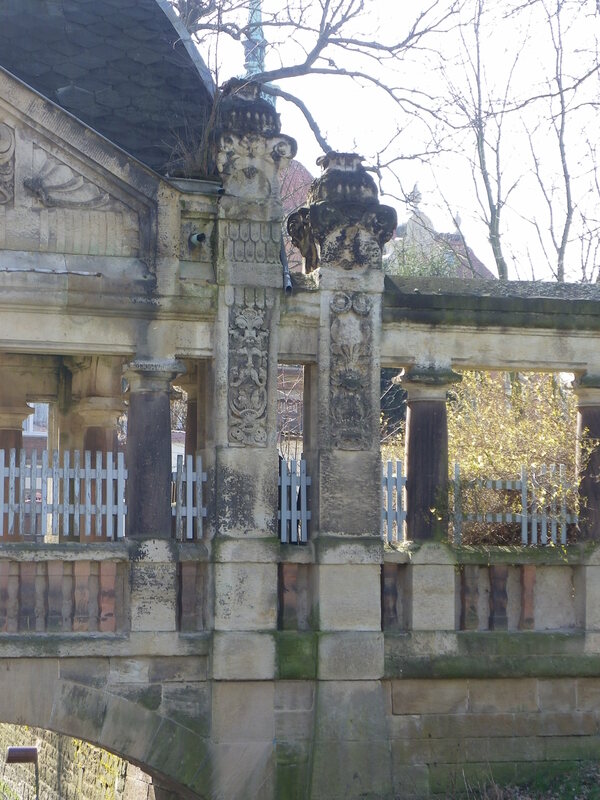 Located along the River White Elster between the cities of Gera and Leipzig, and east of Weissenfels and Naumburg, the town of 29,000 was once an industrial community dominated by the rail, steel and agricultural industries. Today, the town is a poster boy of a typical East German community that has stood still in time. Many historic buildings dating back to the late 1800s to 1930s are sitting empty, but have retained its original charm. The city has been used as a platform for films focusing on the GDR. 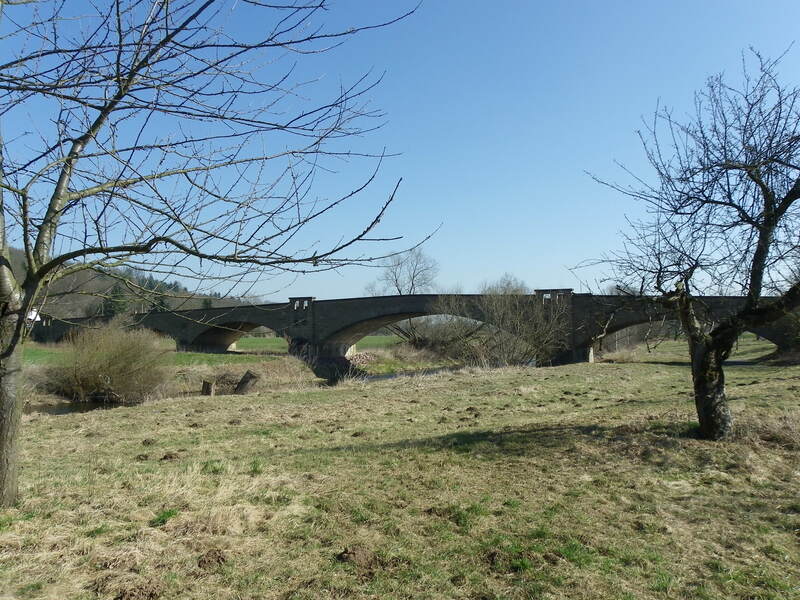 And as far as historic bridges are concerned, it competes with Halle and Quedlinburg in terms of numbers and appearance. The center of the span features a concrete dome covered with black ceramic paneling. The dome is not completely round for it is four-sided, bordered by a grey ceramic lining. The top of the dome is covered by another, much smaller cupola, resembling a small round barn. The reason for the bridge being considered a pavilion is for it is supported by concrete columns, the rounded ones encircle the dome, while six squared-shaped columns make up the front façade facing the river. 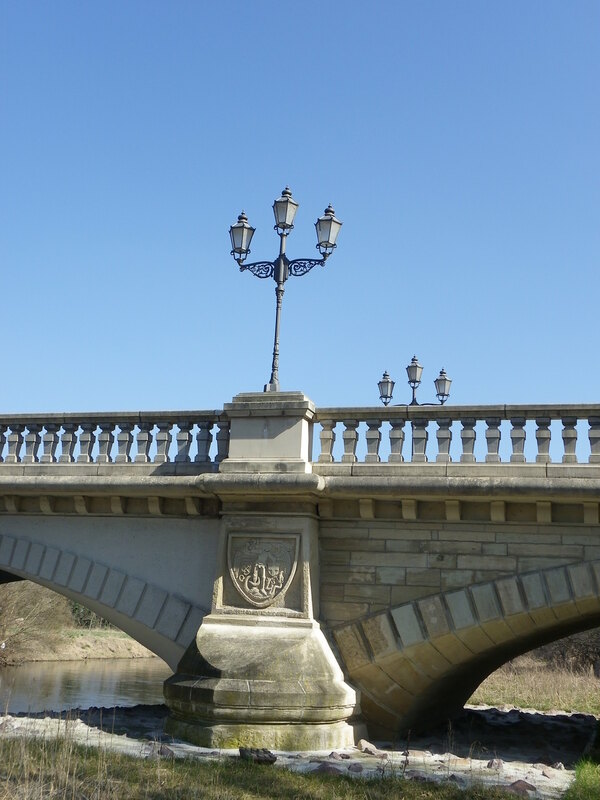 Each side is ornamental, representing a different form of inscribed artwork, topped by a finial with sculptures. The middle four feature two inner ones that are taller than the outer two and that line the canal bank. 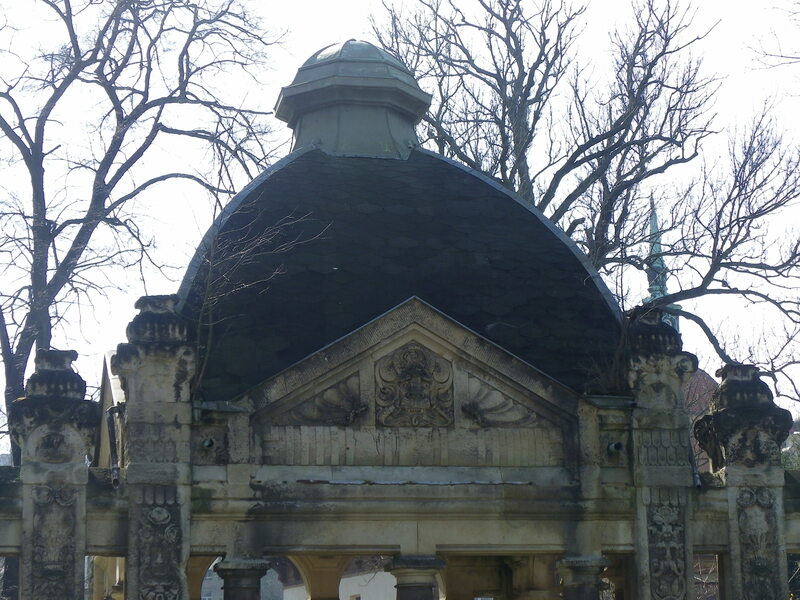 Like the rounded columns, they support the dome and the gabled roof flanking the front end and containing carved artwork. Between the two inner columns are three round columns, supporting the flat head board made of concrete. The outer two of the middle four columns as well as the outermost squared columns also feature three rounded inner columns on each side supporting the head board, resembling the extremely widened version of Brandenburg Gate in Berlin. Photos of the bridge show in detail what the structure looks like in terms of its functionality and aesthetic appearance. 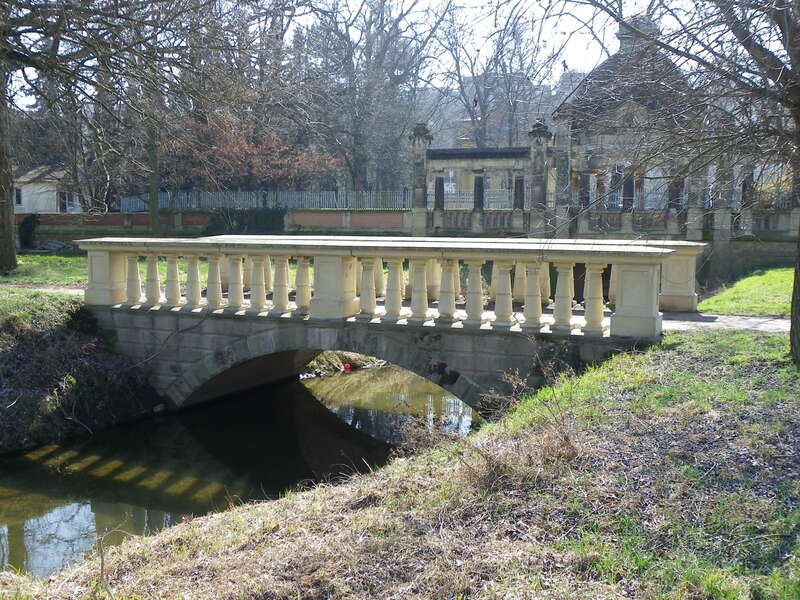 It is unknown when the pavilion bridge was built, let alone who built it. However it is known that the Moritzburg Castle was built in a Baroque style in 1667, replacing an earlier castle destroyed by the Swedish army in 1644 during the 30-Years War. The reconstruction effort took 10 years. Yet the castle dates back to the time of the establishment of the diocese of Zeitz by King Otto I in 968. Both the castle and its neighboring Zeitzer Dom Cathedral were restored in the 1990s and still serves as the key attraction for people visiting the community. 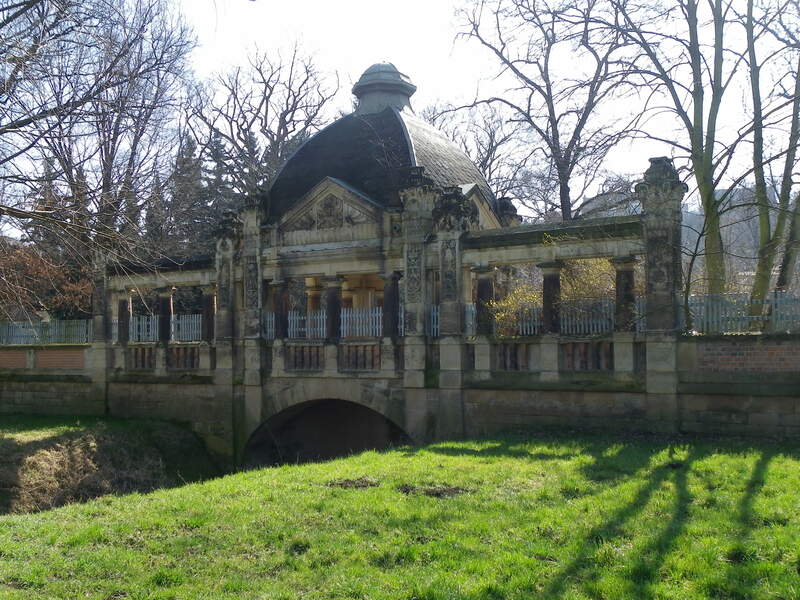 The pavilion itself, given its similar appearance to the rebuilt castle, dates back to the 1700s, yet it is unknown when exactly it was built, who was responsible for this unusual construction, and more importantly, why it was built over the canal that was only 100 meters away from its junction with the White Elster. Any clues as to when it was built? We would love to hear them from you. Submit your information to the Chronicles via e-mail or through its social network pages and any information on the bridge will be added to the tour guide of Zeitz, which will be published in the Chronicles. Zeitz is one area that has not been explored by any pontists- neither from its own country nor from elsewhere. Yet this bridge represents a vast number of bridges in this area that have a very high aesthetic value and potential for history for other people to know about, especially when it comes to their role in the development of the community and how it survived a wide array of adversities, including surviving two World Wars and 40 years of communist rule that ended in 1989. Like the other bridges in the region where the former East Germany existed, the bridges of Zeitz are definitely worth having a look at, especially if we look at this bridge in particular.